A personal project about a family where each member is designed after a different species of moth. When the Marbled Emperor met Cecropia, he caught the scent of her “perfume”, which refers to when a female moth gives off a smell that attracts males. From that moment on, they fell in love and decided to open a perfume shop to help all other moths find true love. 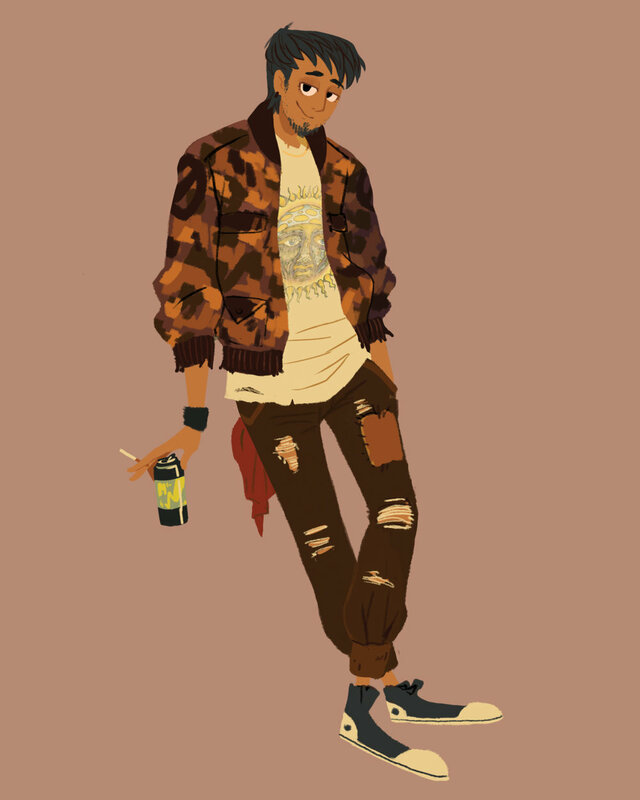 This project centers around character and concept design, as well as fashion illustration. Using different elements from each moth species, every family member becomes very distinctive and unique from the last. As the head of household to the Moths, the Marbled Emperor is one of the grandest and most beautiful. He looks arrogant, but he really just loves the scent of perfume and all of his moth children. He and his wife run a perfume shop and live to help other moths find love. The Cecropia Silk Moth is the hard working mother of the Moths. Like her mother before her, Cecropia is skilled in the art of magic. She brews potions that produce the most beautiful scents for the perfume shop she runs with her husband. The White Witch Moth is one of the eldest witches of her time and definitely one of the strongest. Her reputation as incredibly stuck up precedes her, but she loves to spoil her grand kids. 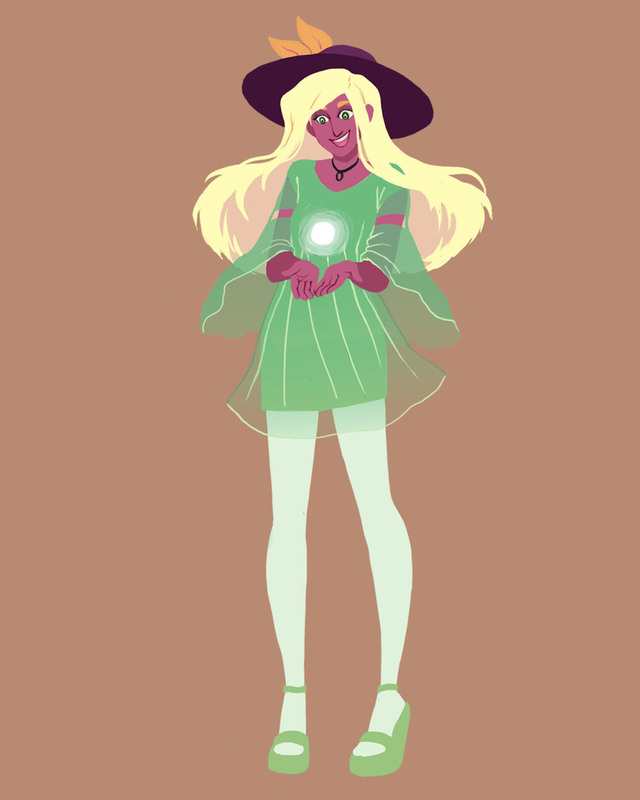 She introduced magic to her daughter at a young age, and is currently mentoring her eldest granddaughter, Luna, in the ways of witchcraft. The Luna Moth is the oldest of the moth children at the age of 24. She's just begun a private study under her grandmother in the ways of witchcraft, but tends to get a little sidetracked in her daydreams. Luna loves to hike and get lost in nature, even in those 4 inch heels of hers. 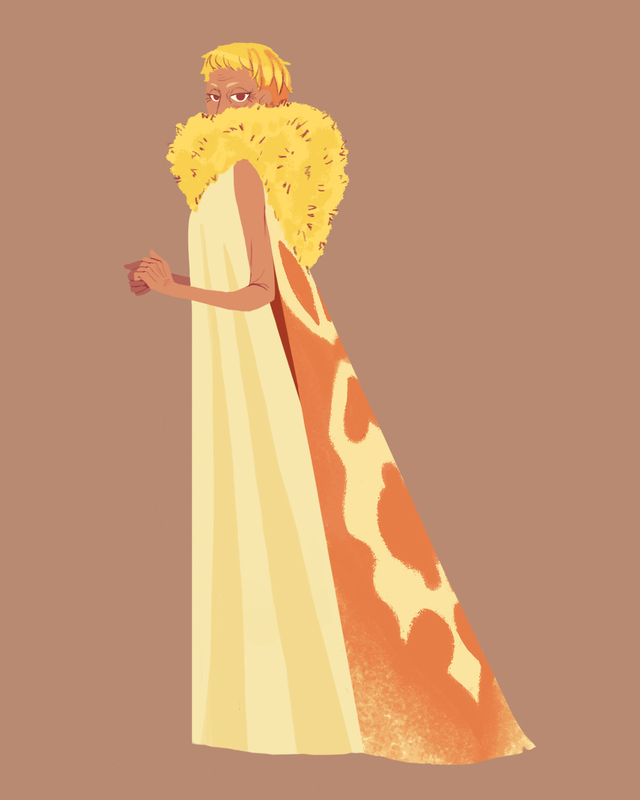 The Promethea Silk Moth is a 21 year old fashion student and the second oldest child of the Moths. Promethea was adopted by the Marbled Emperor and Cecropia when he was 13, after a tragic frost had killed his parents. He's incredibly grateful and works harder than any moth in his senior class. Apart from fashion, he loves old Hollywood movies and cold weather. Promethea is working on a winter coat line as an homage to his favorite classic films. The Madagascan Sunset Moth is the most vibrant moth you'll ever meet, in both personality, and in style, thanks to his boyfriend Promethea. 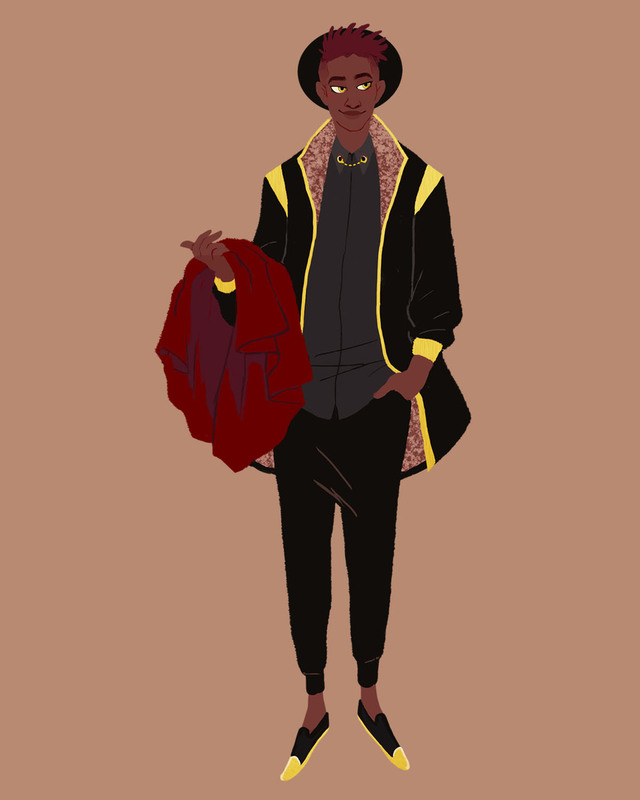 Mada moved to the US from Madagascar to attend college where he met Promethea. He's currently in grad school moving towards his masters in musical theater. Throughout the Moth household, the mysterious Ghost Moth is all but a myth. Dawned with the face of his great great grandmother, the Marbled Emperor tells bedtime stories to his children of this tall and eerie figure roaming the halls. If you listen closely, you can almost hear the sound of her heels slowly clacking upon the hard wooden floor. The Rosy Maple Moth is the next eldest daughter of the Moths at 16 years old. She's a sophomore in high school widely known for her family's reputation as powerful sorcerers. Rosy is a sucker for romance and is dating who she would call the coolest boy in school, though some might not think so. She can't wait to learn magic from her grandmother and take over the family business one day. The Grease Moth is a young high schooler named Devon, currently dating the Rosy Maple Moth. He may seem like just the average greasy stoner from your algebra class, which he is of course, but he's got a heart of gold. Devon spends most of his time chilling in his parents basement, listening to grunge, and thinking of sappy love poetry for Rosy. Her family, however might not be the most keen on their relationship. The Comet Moth is the second youngest child of the Moths at age 9. When he was about 6, he started lessons in ballet and fell absolutely in love with it. In school, Comet isn't the most social and lots of kids pick on him for being a dancer. He tries his best not to worry about them and focus on his work, even though it gets a little lonely. He is insanely hardworking and wants nothing more than to be a star, so his parents call him their little Comet.